1. Can we Drop by and Visit your Dogs and Puppies? A wonderful part of our business is getting to know the families who adopt our puppies. As much as we would enjoy visiting in person at our home with everyone who is interested in meeting our Australian Labradoodles, it is just not safe for our puppies. We totally understand families want to touch and hold and smell a newborn puppy, but in the interest of the safety of our puppies, we have a visitation policy in place to protect their health and safety. Immature immune systems. Puppies are not protected against disease that can be brought in on shoes or clothing. Many breeders have lost entire litters of puppies due to disease being brought into the breeder’s home. You don’t have to touch a puppy to transfer disease to them. Your shoes and clothing can bring it in and leave it on the floor or furniture, only to be transferred to the paws of the mama dog, who then transfers it to her babies. New mama dogs are extremely protective of their babies. When strangers enter the home, even if mama is in another part of the house, she hears their voices and kicks into a highly emotionally charged state. This stress causes her body to create cortisol, which enters her milk. When the puppies consume the milk, the cortisol then causes them to become stressed as well. A stressed puppy is more likely to succumb to illness and fail to thrive. Stressed mama dogs may panic. They could jump up and away from their puppies to assess what they think is a threat, and many times unintentionally step on or crush a puppy. The mere sound of a stranger’s voice in another room may cause them to panic and can result in an injured puppy, or even death. In lieu of visitation, we are happy to talk with you by phone or email. We keep our Facebook page updated frequently, and are happy to provide lots of pictures and other complete information on each puppy and litter we produce. 2.How is a multi-generational Australian Labradoodle different from other Labradoodles? What is a Multi-generation Australian Labradoodle? A multi-generational Australian Labradoodle is a puppy with Australian Labradoodles as both parents. The Australian Labradoodle is a breed that originated in Australia with the goal of creating a purebred dog that could be used as an allergy friendly service dog. These puppies are the result of significant time and investment through many generations of selective breeding of only the most desirable traits to produce non-shedding and allergy-friendly pups that are very smart and have a consistent calm and loving temperament. Multi-generational Australian Labradoodles have since been proven wonderful service and therapy dogs. JoaLins Australian Labradoodles breeds multi-generational Australian Labradoodles because of the consistent quality of the puppies' coats, appearance, and temperament. A Labradoodle is a dog that was created from breeding a Poodle with a Labrador Retriever. They are often labeled F1, Fb, etc. Genetically, the pups are usually not consistent which can result in some being more like one parent or the other - these puppies have a wide variety of looks and coats from flat hairy short coats of a labrador to very woolly poodle coats. Coats can also vary in length, thickness and texture. Regardless if the puppy is a 1st or 3rd generation, the look, temperament, size, coat and health aren't predictable. In addition, many of these dogs are being bred without the diligence of genetic health testing that is mandatory for producing healthy puppies. It is important to remember that you are bringing home a family member. It is also extremely important to know what you are bringing home to your family. 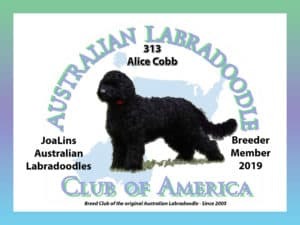 If you want a Labradoodle with good temperament, that has a beautiful allergy friendly coat and doesn't have genetic health issues, an Australian Labradoodle is for you. Just remember you always get what you pay for, and there is no way to responsibly breed quality dogs that have health tested parents, and sell them cheaply.